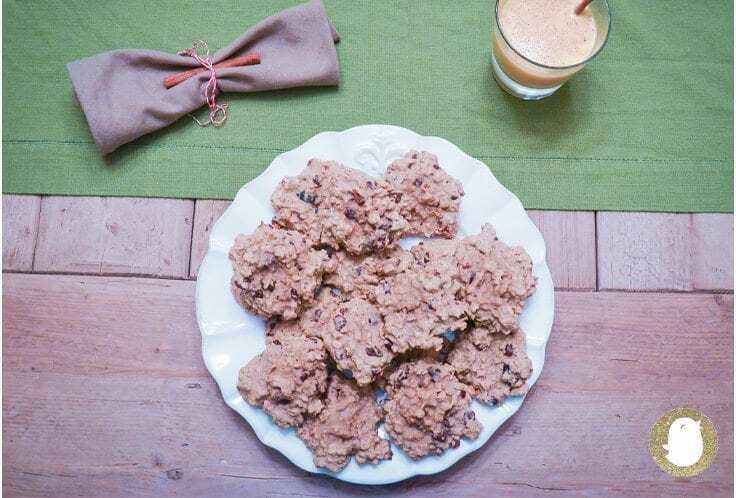 Lactation Cookies With a Holiday Twist! Allow two cups of butter to come to room temperature. Then combine the butter and a cup and a fourth of brown sugar in a large mixing bowl. Next, add one egg and a teaspoon of vanilla. (I will be honest. I added way more than a teaspoon to the bowl!) Mix until light and fluffy. Add two cups of oats, a cup and a half all purpose flour, a pinch of salt, a half teaspoon of cinnamon (I added closer to two tablespoons because I love cinnamon for the holidays), three tablespoons brewer’s yeast, and a fourth a cup milled flax seed to the mixing bowl. Stir until well combined. Finally, it’s time for mix-ins. (You probably don’t want to use more than two cups total.) I chose a half cup of dried cranberries, a half cup chocolate chips, and a half cup chopped pecans. You can add whatever you like — that’s what makes them “kitchen sink cookies.” Other options include shredded coconut, raisins, and other dried fruits like apricots. It’s totally up to you! Allow to cool completely, and then enjoy! Happy (and delicious) holidays, Mommy Chicks!